The IRS Universal Contacting Multiplexer (UniCoMux) is a stand-alone system that can be used to establish an electrical connection between the system input and one of several outputs (1:N Multiplexer). 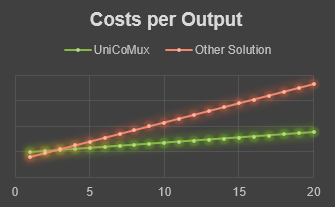 You can use the UniCoMux for batch testing your devices and share expensive measurement equipment. Each device can use the same hardware components. The system uses two built-in axis controllers to move a contacting unit to the target position where a specific output is located. In the standard version, you can integrate up to 20 outputs with 108 wires each. Starting at a minimum of 6 outputs, the UniCoMux scales up to 20 outputs by varying its height. Additionally, the system can be adapted to your customized application and even more outputs can be added. The maximum number of outputs depends on the connector size and available space. In the standard version one row of outputs will be used. For more complex applications additional rows can be added to extend the number of outputs. The modular concept of the UniCoMux allows you to adapt the system to your specific application. Depending on your requirements you can choose a specific connector type that fits your needs. Additionally, you can define the cable harness inside the UniCoMux between the input and the contacting unit and for example use drilled or shielded cables. You can even use several kinds of cable harnesses for different applications. If your later application differs a lot from the previous one, you can also replace the contacting unit that is mounted to the axis of the UniCoMux. The UniCoMux uses only high reliable components and is very low-maintenance. 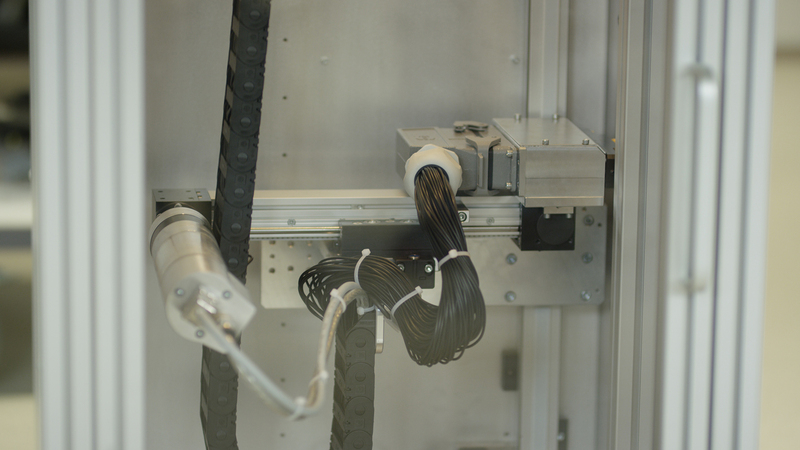 The wear parts can be replaced without much effort: cable harness, input- and output connector as well as the probes of the contacting unit. The UniCoMux applies the brake when the end position is reached to avoid continuous load and overheating of the drives. Each position of the outputs of the UniCoMux must be taught once before you can connect the outputs automatically. This process will be done by IRS when the UniCoMux is delivered but can also be done independently by the customer by using the IRS UniCoMux Teachpanel. 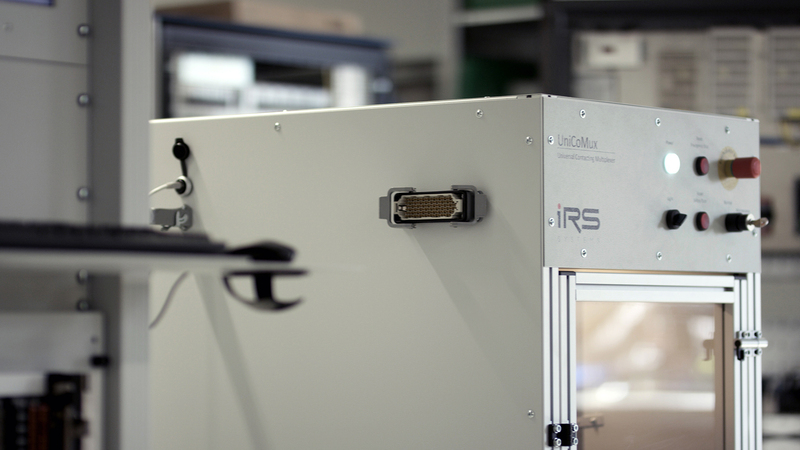 Once configured, the UniCoMux is ready to use and you can use the stand-alone program IRS UniCoMux Movepanel to connect an output. 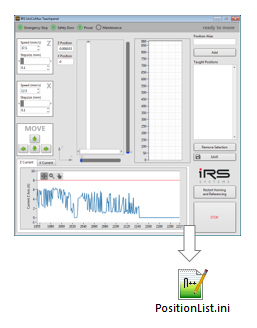 If you want to integrate the UniCoMux within your automated test environment you can use the LabVIEW API that perfectly integrates into your system. The API is a highly abstracted programming interface with only a bunch of functions that must called by your software. You do not need any knowledge of axis programming to achieve desired behavior. The UniCoMux Teachpanel can be used to teach the target position for each output. Position teaching will be done by IRS when the UniCoMux is delivered but can also be done independently by yourself. You can move both the Z- and X-axis independently. Movement speed and step size can be chosen manually for precise position teaching. You can enter a customized ‘Position Alias’ for each position that will be used as a lookup string later in the software. After all target positions are taught you only need to export this configuration so the UniCoMux Movepanel and UniCoMux LabVIEW API can use this configuration file. If you want to contact a certain position later on, you only have to specify the ‘Position Alias’ and the program automatically moves to the related target positions. 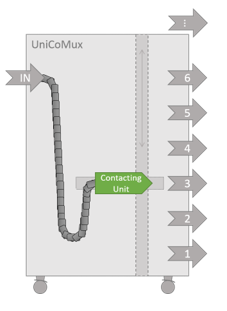 The UniCoMux Movepanel can be used to connect the desired output. The Movepanel can load the configuration file that has been created before and automatically lists all positions. The ‘Position Alias’ will be shown as well as the target position on the Z- and X-axis. You can use this program to manually connect an output and run your tests with your software afterwards. If you want to integrate the UniCoMux into your automated test environment you can use the UniCoMux LabVIEW API. The API contains five functions that can easily be implemented into your test procedure. You only need to specify the ‘Position Alias’ you want to contact and the contacting progress will be done automatically by the API.